New molecule awaits registration, but promises good things as a seed treatment. 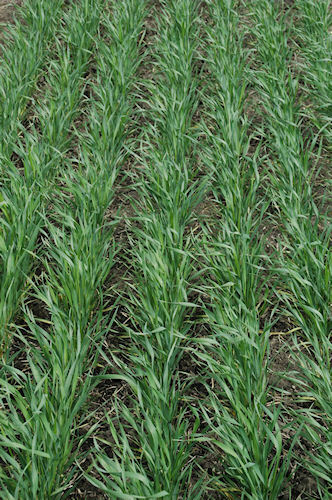 A seed treatment that protects cereal and other crops from all forms of pathogenic Rhizoctonia Solani may be available in the Pacific Northwest later this year, and all across the U.S. in 2012. Marketed as Vibrance, the new crop protectant contains sedaxane, a succinate dehydrogenase inhibitor. It the result of eight years' selection from 100,000 molecules aimed at providing a seed treatment to arm plants against the ravages of root damage by soil-borne pathogens. Sedaxane is a broad spectrum fungicide that is particularly effective against all pathogenic strains of Rhizoctonia along with a number of bunts and smuts. 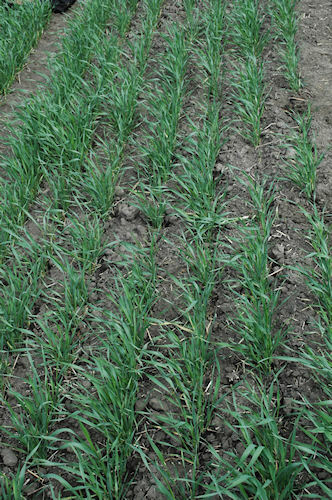 Untreated wheat in a Syngenta test plot near Rosalia, Wash., shows a good stand but less-than-desirable growth and vigor. "By protecting the plant from germination through seedling stage, the grower can protect the crop's yield potential, and in turn add more stability to yields at a time we're facing the need to double our crop production over the next generation," noted Christian Schlatter, Syngenta's global asset manager. Syngenta says sedaxane penetrates the invading fungal pest and interrupts its energy-making chemical reactions, leaving the invader to wither and die. In addition, sedaxane is mobilized around the newly-planted seed to await fungi in the soil, and remains active in proximity of the root for several weeks. During the seedling phase, sedaxane is also translocated to the leaf structures of the plant, providing additional fungal resistance to air-borne disease organisms attacking the leaf. This plot, protected by the company's new sedaxane fungicide seed treatment shows much better vitality and developing canopy. Officials say Vibrance is expected to be labeled for cereal crops, soybeans, canola and sugar beets in 2012-2013 in the U.S. and Canada. At the end of that time, it is expected to be in the labeling process for corn and potatoes. Pending individual registration status in countries across the world, Syngenta will be launching sedaxane globally. Vibrance represents a prime product in Syngenta's quest to improve root health in agronomic crops globally to improve yields and stands, and plant nutrient and water efficiencies. The project carries a price tag of $200 million since it's inception in 2003 and marks the first time a Syngenta product has been designed from the start as a seed treatment, and has undergone a global review. In addition, however, sedaxane will be offered at later dates as a seed-treatment mix with Syngenta's Cruiser insecticide and Dividend Extra fungicide.